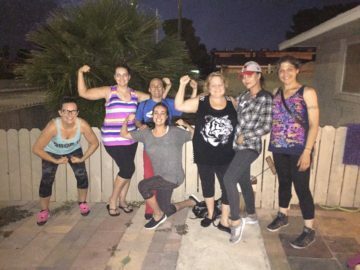 Exercise is one of the best things recovering addicts can do to avoid relapse and build a healthy lifestyle, asserts author, licensed clinician, master addiction counselor and certified fitness trainer Rochelle “Shelley” Poerio. Start Safe. See your doctor to make sure you’re healthy enough to exercise. Learn to stretch, warm up and cool down before and after exercise. This may sound obvious, but so many people fail to do it, end up hurting themselves, and end their fitness plan as soon as it starts. Do Anything. The best exercise is the one you want to do. It doesn’t matter what, as long as you pick something that interests you and do it. If you don’t like to exercise, try “stealth exercise” — things like ping-pong, air hockey, foosball or a simple game of catch. They get you up and moving, and that’s the point. —Specific and measurable. Make yourself accountable to precise days and times. For example, decide to walk for 20 minutes on Mondays, Wednesdays and Fridays. —Attainable. Exercise with a small “e.” Don’t try to run a mile if you can only run 50 yards. Instead, run 50 yards and build up from there. —Relevant or reasonable. Don’t compare “out” to what others can do, or what you think you should be able to do. Instead compare in to your own abilities. Set a realistic schedule that you can keep, and goals that you can reach. —Time-framed. This means “today.” Focus on what you’re doing today, and the progress you’re making — however small — today, and tomorrow will take care of itself. Make it Social. Addictions start to really take hold, and relapses often happen, when you isolate yourself from others. So whatever exercise you choose — even an “individual” activity like running or hiking — do it with others. This not only provides company and support, but strengthens responsibility and commitment. You’ll be more likely to show up every time, because you won’t want to let your friends or team down. Write It Down. Record how you felt before and after exercise. Track how much weight you lose, how much your blood pressure improves, how much less insulin you’re using. Digital bracelets and other new technology are great ways to measure how many steps you took or calories you burned. Write all this down in an exercise diary. It only takes a couple minutes, and it’s a great way to maintain your enthusiasm and motivation. Be “Mindful.” Use exercise to take your mind off your problems, the future, even your goals. Let your swim, your basketball game, your gym workout be a way to stay “in the moment, ” and experience the beauty and value of simply being alive.